Sinful Colors is a drugstore brand that you can find at Walgreens, Target, etc. and can often be purchased on sale for $0.99. I happened to get Why Not? during the last Walgreens sale and I am so glad I did. It's a medium blue creme that I received 4 compliments on. 4! For me, that's actually a lot, because not a lot of people see my nails since I have to use nitrile gloves all day. The formula was a little thick, but not unmanageable. The big issue I had with this polish is the staining I got on my skin! I didn't get staining on my nails because of the basecoats I use, but when I was taking it off, it stained my cuticles so bad! If you're ok with staining, Why Not? may be for you. I have this color & can't wait to wear it! Lovely blue. I have such a weakness for blues esp. in the past 3 yrs. Staining? Not so good to hear 'bout that. I usually can get around staining if I think or know a shade is guilty of that by keeping swaps with acetone right at my side while doing each nail and getting the 'off the nail' stuff off asap. Post mani staining I have been using a couple DIY soak things I found on the net that help bring back health looking nails. Sometimes admit am too lazy to do the latter and just polish over or hydrate massively for a day and staining is gone. Exiting you are already doing a return to the far east. beautiful color. 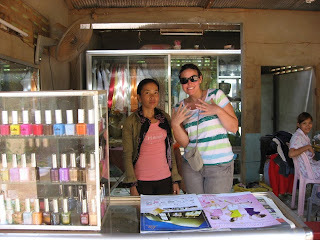 i've been looking through your blog and have to ask you ~ how how how do you get such clean manis. what is the secret to your application. they look perfect.